Since 2014, Virginia has made strong efforts to increase higher education access through its Virginia Plan for Higher Education. The state considers online education a vital component to the educational landscape, and has even passed legislation centered on the continual improvement and expansion of its online offerings. Currently, there are 23 schools in the Virginia Community College System, or VCCS, many of which offer educational programs in an online format. Virginia students ready for college can find programs, financial aid and admissions information, compare schools and get details on the best online colleges in Virginia for 2018 below. 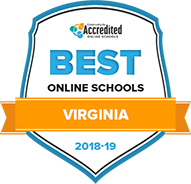 We want to make your job of choosing an online college in Virginia to attend easier, so we’ve started the legwork for you. Taking into account factors important to students like tuition, financial aid, program availability, graduation rate and student-teacher ratio, we’ve crunched the numbers to determine with Virginia schools give students the best mix of quality and student support below—learn more about the best online colleges in Virginia for 2018 to kickstart your college search. James Madison University is host to an array of distance education alternatives. Undergraduate students can complete their RN-BSN through hybrid coursework, or earn an autism certificate through a fully online, 1-year format. The adult degree program customizes a bachelor's degree to fit your needs and interests by utilizing any academic history and life experience to count toward transferrable credits. Graduate students also have the choice to participate in 100% online master's programs in subjects such as educational technology, computer science, mathematics or speech and language pathology. If travel interests you, there are opportunities to pursue political science, business administration, science, Spanish or nursing in courses that are completed abroad with the combination of online and on-campus studies. The distance education webpage features an online readiness self-assessment to help determine if distance studies are a good fit for your lifestyle. Classes, which are semi-structured, use the web platform Canvas to implement video lectures, group projects and class discussions. With over 250 certificate, associate, bachelor's, master's and doctoral-level online degrees, Liberty University is a faith-based institution that is committed to providing affordable schooling. There are a number of scholarships specific to distance education students, military personnel receive a discounted tuition and all students have access to free e-books for every undergraduate course. Program options include aviation, divinity, behavioral sciences, government, nursing and more. In order to stay connected to the campus community, students can submit prayer requests via the web, take advantage of a video library, receive assistance from the writing center and find technical support for the platform Blackboard Learn. You can also sign up for webinars throughout the year, which allow you to ask questions and discuss concerns. The Online Student Advocate Office offers support for issues concerning financial aid and academic advising. Program length, tuition costs and graduation requirements vary depending on the number of credits being transferred over, as well as the degree of choice. At George Mason University, there are over 50 hybrid and fully online programs for students to complete undergraduate and graduate degrees in subject areas of science, math, health, engineering, business or education. Some coursework is implemented on a set schedule, requiring students to access their virtual classroom at a specific time of day. Other classes are self-paced, allowing for even more flexibility. GMU faculty members teach all curriculums, and makes use of blogs, social media and discussion boards to engage their classroom. Distance education students can utilize the same resources as those studying on campus. This includes an after-hours nurse who is available for medical advice, counseling resources, and access to the Student Support and Advocacy Center, which assists in developing and maintaining a healthy lifestyle. All students will also be connected to an academic advisor, who can provide information regarding transfer credits, tuition, financial aid and graduation requirements for each program. Regent University is a Christian-based learning institution offering 129 programs to receive an undergraduate or graduate degree in hybrid or fully online formats. You can find options in business, theology, education, nursing, STEM and more. Semi-structured curriculums are delivered through the web platform Blackboard Learn and Blackboard Collaborate. Students participate in real-time lectures and discussion posts, as well as self-paced assignments, with an average of 17 other students in each virtual classroom. Undergraduate classes run for 8 weeks, and graduate course duration depends on the program of choice. If you are unsure if online coursework is the right choice, you can use the ?test drive? tool to explore a class at no cost. For students with prior credit, the school maintains a generous transfer policy by accepting up to 90 hours. Although you will be learning off-campus, the school involves distance education students in the campus community by welcoming you on mission trips and study abroad experiences. Students looking to build upon their undergraduate education can pursue a master's degree or professional certificate in a hybrid or fully online format at Virginia Tech. Twelve graduate programs are available in disciplines ranging from aerospace engineering to information technology. There are 10 certificate options, which include subjects such as nuclear engineering, integrative STEM education, or security studies. As a member of the State Authorizations Reciprocity Agreement (SARA), online programs at VT are recognized within other SARA institutions and states. Most coursework can be completed at a part or full-time pace. However, certain programs require you to follow a specific plan of study. All classes combine readings, discussions, and video conferencing. Online students can take advantage of a number of resources, including career services, a women's center, counseling and academic advising. There are financial aid opportunities for all students, and military personnel qualify for additional incentives and fee waivers. At the University of Virginia, students can earn a bachelor's degree in interdisciplinary studies or health science management in a fully online format. You must have enough prior credit in order to transfer to UVA as a third-year student, where you will spend 3-4 years completing 60 credit hours to receive a degree. This option is also available for a master's degree in public safety, which combines both on-campus and online coursework to finish 30 credit hours. There are a number of undergraduate and graduate online certificate options in subjects ranging from accounting to public relations. Coursework is delivered in both asynchronous and synchronous formats through the platform UVaCollab, which uses interactive features such as discussion forums and video conferencing to engage students. Although you will rarely step foot on campus, admitted students are required to attend orientation in Charlottesville. In and out-of-state tuition rates are the same, and you can take advantage of scholarship, financial aid, and payment plan opportunities to help with costs. Old Dominion University has been providing distance education since 1994. Degree options have expanded to over 120 minors, certificates, 4-year bachelor's, bachelor's completion, master's and doctoral-level degrees since that time. Most curriculum follows the ODU on-campus schedule, with certain programs being offered at an accelerated pace. Some classes take place in real time, requiring students to stick to a specific schedule, while others can be accessed at any point throughout the day. All coursework is taught by ODU faculty, and implemented through the web platform Blackboard Learn. For active-duty service members living abroad, certain curriculum is available in DVD format. Military personnel also receive a discounted tuition. All students receive support services such as tutoring, writing center help, online study groups, and library access. Enrollment coaches are available to discuss academic planning, concerns regarding state reciprocity, and financial aid options. Students can also determine their academic standing by using the school's free transfer evaluation tool prior to applying for any program. Hampton University prides itself on its virtual, online campus, which features a number of fully online academic programs. There are 29 options to receive a certificate, associate's, bachelor's, master's or doctoral-level degree in disciplines such as aviation management, counselor education and religious studies. For those interested in nursing, there are both 1 and 2-year alternatives for an accelerated RN-BSN program. Eight and 16-week courses are completed on your own schedule, and most students complete a bachelor's degree in 4 years. Transfer students are encouraged to go over their academic history with an advisor. This is because military training, credit-by-exam, and life experiences often count toward credit hours. Beyond academic advising, online students have access to financial aid and scholarship opportunities, the library, a writing center, counseling and career services, and technical support. Admissions qualifications, graduation requirements, and program length are dependent on degree of choice and student schedule. For those pursuing a graduate education, Radford University is host to 16 online or hybrid certificate and master's degree programs. Subject areas include criminal justice, art design thinking, cyber security, RN-BSN and educational leadership, among others. Certificate programs take 1-3 years, and require 13-18 credit hours to complete. Master's degrees can be earned in 2-3 years, and require 30-36 credit hours for graduation. Courses are mostly self-paced, and students can customize their workload to be part or full-time. Curriculum is applied through the platform Design to Learn, and combines video presentations, webinars and discussion forums to keep students engaged. There are a number of resources to help online students through their programs, including 24/7 technical support, access to the McConnell Library, and online tutoring services from NetTutor. Although you will want to confirm that your degree of choice is acknowledged in your location of residency, the university is approved by the National Council for State Authorization Reciprocity Agreements. Mary Baldwin University offers 27 online certificate and degree programs. Environment-based learning, health care administration and sustainable business management are just a few of the available curriculums. The courses are self-paced and implemented through the web platform Blackboard Learn, which combines lectures and discussion forms to create a sense of community. Students can transfer up to 90 credit hours, as well as opt for a half or full-time workload. As a result, the time to complete studies varies depending on the student and their program of choice. Tuition also differs for each degree. Admissions representatives are available to assist you throughout your educational experience via phone or Skype conversations. They can provide information regarding financial aid and scholarship opportunities, including multiple benefits for veterans and active military personnel. Online students can also access online tutoring support. Graduates have entered into fields of health care advocacy, pharmaceuticals, special education and social work. Virginia Commonwealth University (VCU) offers 3 undergraduate programs with online components. The 32-credit RN to BS Completion Program is offered entirely online. The BS in Clinical Laboratory Sciences consists of a minimum of 40 credits and is offered in a hybrid format and the Clinical Laboratory Science Distance Education program requires a minimum of 60 credit hours and is offered in a video conference format. Upon graduation, students of the Clinical Laboratory Science Distance Education program will be eligible to take the national examination for MLS given by the Board of Certification of the American Society for Clinical Pathology. Programs may be offered part time or full time, and on-campus requirements may be necessary for the completion of different degrees. VCU applicants are assessed based on academic performance, employment experience and extracurricular activities. Interested students must have completed at least 20 credits and submit past official transcripts, essays to be completed within the common application, at least 1 recommendation, and GED and/or SAT or ACT scores. In addition, online students have access to many resources to aid them in their educational journey, including technology services, the library, the campus learning center, the career center and technology services. Norfolk State University offers online undergraduate degrees in various disciplines, such as history, psychology, business-information management and nursing. Courses are available 24 hours a day, allowing students the flexibility of completing their work at times that are convenient to them. Depending on the specific program, students have varying graduation requirements, which may include on-campus courses; however, all students must meet with their academic adviser prior to graduation to review their Academic Evaluation (EVAL). Students have access to an online orientation at the start of every semester to familiarize themselves with the tools that will be used for each online course. In addition, students have access to multiple electronic systems, including online textbooks, academic assistance, and tutoring and career guidance in order to advance their educational and professional goals. The Office of Extended Learning (OEL) provides support to online students as well as faculty to ensure the integrity of the program. Interested students should submit 2 letters of recommendation, SAT or ACT scores (if under the age of 21) and should have completed a minimum of 22 units or have a GED score of a least a 530. Virginia University of Lynchburg provides distance learning courses in order to reach students who can't attend classes at one of their locations or who wish to continue their education in a more flexible manner. Undergraduate programs offered online include religious studies, business administration and organizational management. This historically African-American Christian institution seeks to guide and provide the resources necessary for its students to realize their spiritual, academic and vocational potential. Interested students must have a high school GPA of a 2.0 or a GED score of 530. Those transferring from other institutions must have at least a 2.0 GPA. High school and college transcripts must be submitted along with TOEFL scores for international students. The university will take academic achievement, personality and character traits, along with the physical and emotional health of the student into consideration when determining admission. Students may receive credits based on professional certifications, technical training, national examinations and previous college courses. Students with prior military experience may also receive credit for their training experience. Graduation requirements vary depending on the bachelor's program selected. Bluefield College is a Christ-centered school located in Southwest Virginia that offers a variety of undergraduate programs online. Online areas of study include business administration, criminal justice, nursing, early childhood education, human services, organizational leadership, cybersecurity and ministry leadership. Applicants will need to submit their SAT or ACT scores, high school and/or previous college transcripts as well as the application. Students should also have a minimum 2.0 GPA, a minimum score of 860 on their SAT or 18 on their ACT, and have ranked in the top half of their class. With its small student-to-teacher ratio, students can expect consistent interaction with professors who possess academic credentials, practical experience in their respective fields and a curriculum focused on the Christian faith. Distance learners have access to the school's library for research needs as well as the Academic Center for Excellence, which offers tutoring, math and writing labs, academic coaching, testing and disability services for students. In addition, online students benefit from discounted rates. In order to graduate, students must complete 126 semester hours of general education and major-specific requirements with a GPA of at least 2.0. Veritas Baptist College offers online bachelor's degrees in Ministry and Christian Education. Accredited by the Transnational Association of Christian colleges and (TRACS), VBC's online Bachelor of Ministry includes concentrations in the Bible, Church Ministries, church business, youth ministry and pastoral studies. The bachelor's degree in Christian Education includes concentrations in Elementary Education and Secondary Education. Both undergraduate degrees require 120 credits for graduation. Courses are self-paced and allow students to access weekly recorded lectures online as they wish. No minimum GPA is needed, but those with a 2.0 GPA or below may be accepted on academic probation. Applicants must submit a list of academic references, official transcripts, application fee and written acceptance of the school's doctrinal statement. Prospective students are also expected to be active in their church communities. All online students pay $225 per credit hour. VBC offers several faith-based scholarships for which students must apply in addition to completing their FAFSA information to help online students cover the cost of tuition. Online students at Jefferson College of Health Sciences choose from bachelor's degree programs in Emergency Services, Health Services, Health Care Management, RN to BSN and Public Health. All required courses are available entirely online. Some of the online degrees are designed for students already working in the field in some capacity but offer satisfactory foundational instruction for students new to the field. JCHS can help learners earn the necessary credentials to advance their careers or enter confidently into new professions in the Health Sciences. Online courses are delivered in a synchronous format with collaborative projects, discussion boards, group participation and live conferencing. Online students have full access to the library with full-text journals, databases and ebooks. Distance learners also receive 24/7 technical support through the Technology Service Center. Interested students need to complete an online application, submit their official high school transcripts and, if applicable, college transcripts. Requirements vary per program, but online students should plan on sending their SAT or ACT scores, as well. Virginia International University is a private, nonprofit school established in 1998 and is nationally accredited by the Accrediting Council for Independent Colleges and Schools (ACICS). VIU's online education program offers 2 bachelor's degrees: a Bachelor of Science in Business Administration and Bachelor of Science in Computer Science. Each degree requires 120 credit hours of coursework. Classes can be completed 100% online with no on-campus obligation. Incoming students may be eligible to transfer up to 50% of the credits needed for graduation. VIU offers courses on a flexible 8-week format with 6 starting dates per calendar year. All online students pay $422 per credit regardless of their residency status. Distance learners in these bachelor's programs have access to academic writing services, the Career Center for professional networking and employment assistance and IT help. Prospective students need only to complete an online application form and submit a copy of their high school diploma or GED documentation and a government-issued photo ID. Bethel College is a small, private, nonprofit institution affiliated with the Assemblies of God Church. The school offers one online degree: the Bachelor of Science in Church Ministries. Distance learners choose between concentrations in Biblical Studies, Ministerial Leadership, Missions and Christian Counseling. Accredited by the Association for Biblical Higher Education (ABHE), this is a 130 credit degree program that distance learners typically complete in 4 years. Students take 37 credits of General Studies consisting of English, Math, Sciences and the Humanities. Depending on the concentration, Biblical and Theological studies and Professional studies consist of approximately 40 and 35 credit hours respectively. Students also have 18 credits to choose interdisciplinary electives and tailor their degree to fit their academic goals. To apply, prospective students submit a biographical essay explaining why they wish to attend Bethel as well as their official high school transcripts. Applicants also need a letter of recommendation from both a pastoral and personal reference. How can I find which online colleges offer the degree I'm looking for in Virginia? Students can access a list of Virginia school's on the State Council for Higher Education in Virginia (SCHEV) Colleges and Universities page. Each school has an accompanying profile, providing students with detailed information and data, ranging from the school's most popular degrees to its graduation rate, retention rate, average loan debt and demographics. Students can also access a school's program inventory through its profile, or directly through SCHEV's Degree Inventory tool. Online students may be particularly interested in the Distance Learning Programs inventory, which allows students to see all online programs in Virginia, sorted by institution and degree level. The programs in this list can be completed entirely online. Students who have a specific program in mind but aren't sure whether it's offered online can always reach out to program advisers and coordinators to double check. Which online schools in Virginia will accept my transfer credits or work/life experience? The Virginia Plan for Higher Education aims to make it easier for students to transfer their credits and understand the transfer process. A 2016 study by the Joint Legislative Audit and Review Commission found that many transfer students weren't carrying their credits from one institution to another. This is because opportunities to transfer schools in Virginia were on the rise, while information on transfer policies and processes remained outdated and confusing. Since then, however, the credit transfer process has become more streamlined and unified between institutions. Many colleges–like at Virginia Tech, where one in five graduates begin as transfer students—make it easy to change schools and receive credit for prior courses. These schools may also grant credits for prior military or work experience. Institutions vary on their policies, regarding how many credits students can transfer, the required GPA for transfer students and other transfer application particulars. Students can find school-specific information on the SCHEV Transfer Options page. How Much More Do College Grads in Virginia Make? In Virginia, a college degree can have a huge impact on a person's income. On average, Virginians working in positions that require bachelor's degrees make nearly twice as much as those who have occupations that require a high school diploma. Job opportunities in Virginia are expected to increase by 9.3 percent by 2024, meaning demand for qualified employees will be even higher. The highest-paying, in-demand careers for those with bachelor's degrees are in the computer information and software development sectors. Software developers, computer systems analysts, computer and information systems managers and information security analysts are projected to experience high job growth, plus earnings in the range of $100,000 or more per year. Careers in the medical and social services fields are also projected to grow over the next few years. Virginia aims to be the best-educated state in the country, and one important step is ensuring that students have access to high-caliber online degrees. Students can do their part in making sure they enroll in quality programs by checking into their online schools' accreditation status. Accreditation is a voluntary evaluative process that institutions or programs may undergo to prove they meet certain quality standards of quality. Schools may receive either institutional or programmatic accreditation, or both. Institutional accreditation assesses the quality of a school as a whole, and the highest standard of institutional accreditation is granted by regional accrediting boards throughout the United States. The regional board in charge of evaluating the quality of online colleges and universities in Virginia is the Regional Southern Association of Colleges and Schools, Commission on Colleges (SACSCOC). Along with institutional accreditation, individual programs of study may undergo program-specific accreditation. For instance, Virginia's George Mason University is accredited by the SACSCOC, and its online bachelor's in business management program is specifically accredited by the Association to Advance Collegiate Schools of Business (AACSB), the national standard for business education accreditation. Virginia is home to a rising number of young adults—particularly from underrepresented groups — who need advanced educations to fill in-demand occupations across the state and contribute to social and economic growth. However, the cost of attending college in Virginia has continually increased at a rate that keeps many students from obtaining degrees. The state continues making efforts to increase higher education accessibility, and make it more affordable. Still, prospective students should consider tuition costs for in-state, out-of-state, and online students, as these vary considerably between Virginia colleges. It's common for online bachelor's programs at Virginia schools to cost around the same for online students as it does for in-person students. Most online courses require an online course fee to cover the costs associated with operating an online platform. For this reason, online students typically end up paying around $30-$50 more per credit hour than their on-campus counterparts. These additional fees may be offset by potential savings on expenses related to transportation, parking, and on-campus meals. Nonresidents, whether they take courses online or in-person, usually end up paying significantly more to attend a Virginia college. Out-of-state students at George Mason University, pay around 3.5 times more in tuition than resident students, plus additional online course fees. At James Madison University, distance education costs less than in-person coursework for both in-state and out-of-state students, but non-residents still pay a premium for their classes. When determining tuition costs in Virginia, there is no catch-all answer, so it's important for online students to research each particular school and program to find out how much its degree will cost. What are Virginia's requirements to qualify for in-state university tuition? Tuition costs for Virginia non-residents are often considerably higher than for in-state students, but establishing residency in Virginia is fairly straightforward. Students must live in Virginia for a full 12 months before their first day of classes, and demonstrate intent to make Virginia their permanent residence after graduation. It's not enough simply to live in the state for a year—students must prove that they moved to Virginia for reasons other than school. They can do so by showing employment in Virginia, changing voter registration and actually voting in the state, property ownership, or by paying Virginia income taxes. Students who live outside of Virginia but work (or have parents who work) in the state may also qualify for in-state tuition. Full residency details are available here. Those who are unable or unwilling to establish residency in Virginia may still qualify for in-state tuition at certain schools. Virginia is part of the Southern Regional Education Board (SREB), and some schools participate in the Board's Academic Common Market, which grants in-state tuition to students who live in other SREB states. This can be particularly beneficial to online students seeking degrees from Virginia schools, who get the convenience of distance education without taking on the extra cost of out-of-state tuition. Are online credits more affordable in Virginia than other places? How can I get help paying for online college in Virginia? Students enrolling in online colleges in Virginia should start their financial aid search by completing the Free Application for Federal Student Aid (FAFSA). This gives students the opportunity to receive federal loans and grants, which can help offset the cost of tuition. Most need-based scholarships in Virginia use FAFSA information to determine student eligibility, too, so completing the form early can give students the best opportunity to receive aid. The Virginia Commonwealth Award may cover the full cost of tuition and fees for qualifying students. The Granville P. Meade Scholarship awards high-achieving, financially disadvantaged Virginia high school students who want to attend college in the state. Students can find a list of Virginia scholarships and grants on SCHREV's Financial Aid Programs page, and they can access more state- and institution-specific financial aid information and resources here. Sometimes students begin their college education but have to take significant time off for personal or financial reasons. In some cases, circumstances keep students from attending college in the first place. Virginia acknowledges that in order to grow the state socially and economically, learners of all ages and experiences need educational access. As a result, adult education programs were created to help non-traditional students continue their education. Often times, these courses can be used as a stepping stone for students who will go on to earn their college degree. Adult high school diploma programs – for aspiring Virigina college students whose first step is to take the GED or earn a high school equivalency certificate. English learner programs – for students learning English to earn citizenship or take online college coursework in English. Basic education programs – for students in Virginia who need to refresh their math, reading and writing skills before going back to college. Lifelong learner programs – for seniors interested in pursuing college credits to brush up on technical skills before enrolling in an online degree program. To locate programs in your area visit the Virginia Adult Learning Resource Center website. In 2017, nearly 20,000 people across Virginia participated in adult education programs.